Cappellano Hermanos were book publishers during the 1920s and also commenced producing playing cards around this time. 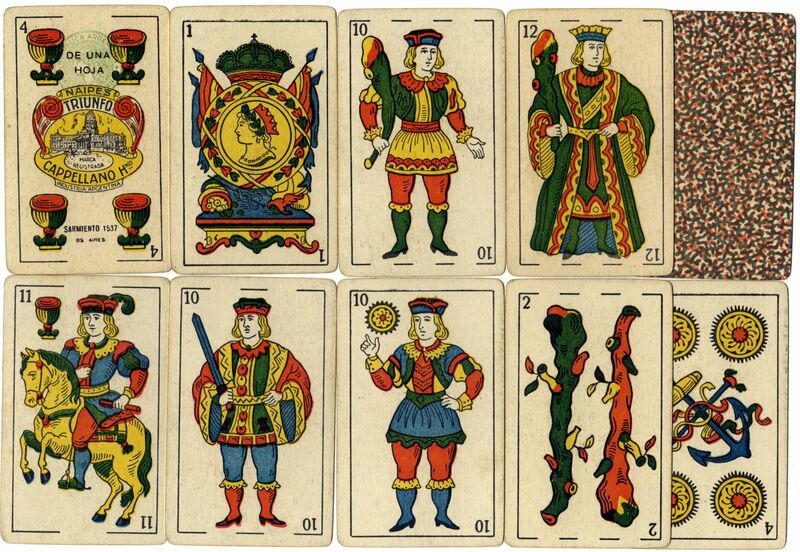 The cards below are their first known Spanish-suited designs. The four of cups has the green 'Mercury' tax stamp used on home-produced cards at this time and the address is given as Sarmiento 1537, Bs Aires. 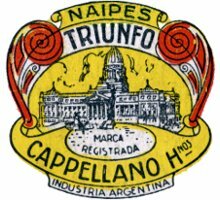 Above: naipes TRIUNFO made by Cappellano Hnos, Sarmiento 1537, Buenos Aires, 1920s. This is an early version of the Ace of Coins and court card design, showing the Argentine flag draped around the central medallion and simplified courts. At some time (c.1930) the design of Naipes Triunfo was re-drawn in a more conventional style which resembles the cards of several other manufacturers of the time. The Art Nouveau logo on the Four of Cups was retained for a while, until this was also replaced in c.1945. Above: cards from a slightly later edition of Naipes Triunfo by Cappellano Hnos, c.1930-40, with gold edges, showing the re-designed Ace of Coins and court cards which were used in all Naipes Triunfo decks thereafter. The address is given as Sarmiento 1537, Bs Aires. See next page →.